It was time for my Birthday dives again! We ended up going out on the 19th of May, a few days before the actual Birthday. Forecast was looking rather promising so we took both the boats down to Queenscliff and started heading out through the Heads. Unfortunately the conditions in the Heads were quite choppy and while the Big Boat I was on got through Luke decided to turn the Little Boat back and do a dive inside the Bay inside. After confirming that the other boat was ok we continued heading out to SS Coogee, our original destination. It was little bit choppy out there but pretty smooth going after we had cleared the heads. 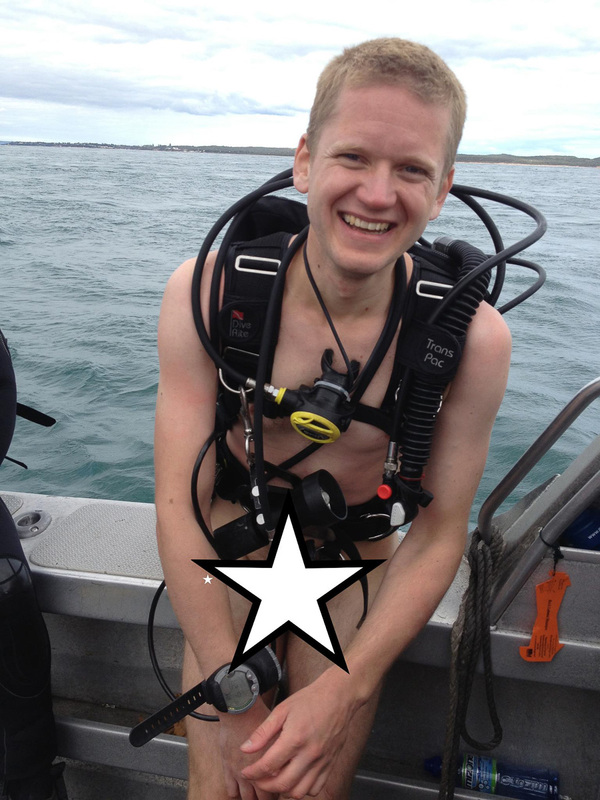 I hadn’t dived the wreck in a long while so I was rather excited. I went down with Mel B and got started with the dive. 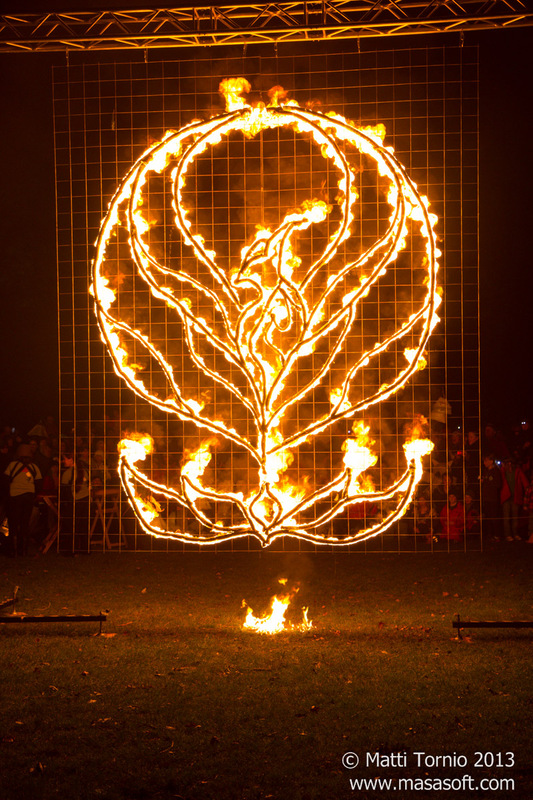 Unfortunately my torch was acting up quite a bit and I spent way too much time on the bottom fiddling around with it. It was little bit murky down there and I even got slightly lost for a moment. 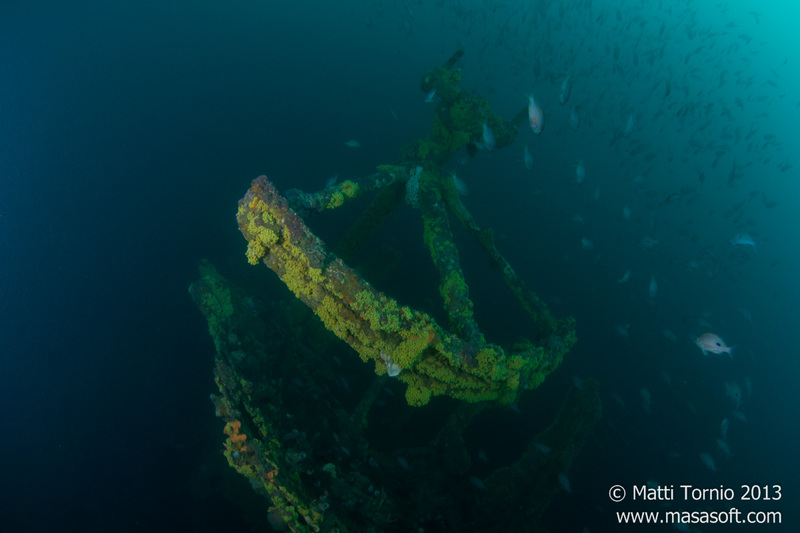 Luckily we relocated the wreck quickly but with the limited bottom time this led to some very limited chances to explore the wreck and take photos. We still had time for a decent look at the boilers and the bow section. Unfortunately by the time we reached the stern section and the most impressive parts of the wreck we were already hitting the decompression limit. After a few quick photos of the stern we had to head back towards the surface already. A real shame, I would love to spend lot more time with the photogenic steering rudder and the schools of fish always swimming around it. To celebrate my Birthday I had made a Finnish style cake with cream and strawberries. A few us already ate our share on the boat, the rest of had their slices back on the shore. This was my first attempt at a cake like this but in general it was judged a success. For the second dive we waited for slack and set out for Lonsdale Wall. We visited a slightly different section than usual, we called this area “the Dirty Steps”. Conditions on the surface had improved significantly: the sun was out in full force and the ocean was perfectly flat. 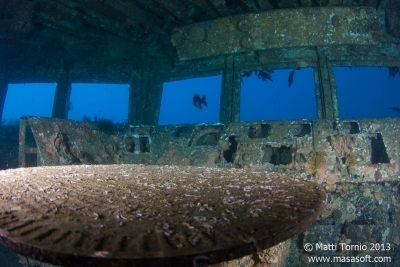 Visibility was still somewhat average but not bad enough to spoil an excellent deep dive. At the Dirty Steps the Lonsdale Wall plummets along several “steps”, small plateaus with steep slopes between. This is one of the deeper parts of the Lonsdale Wall, we went down to almost 50 meters and from there a steep slope kept going down into the abyss. It seems likely the area is used for training too, there were some permanent lines going down from around the 40 meter mark. At that depth we also found some remains of an old sailboat. 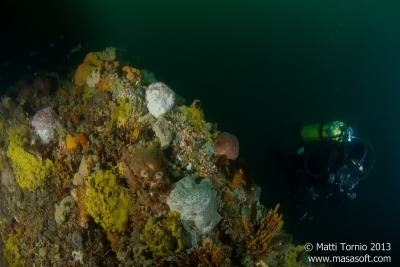 With the poor visibility near the surface it got quite dark deeper down. Limited light and visibility were not the best conditions for photography, but otherwise this was a very moody dive. We even found a large cave entrance on the way back up. Unfortunately we didn’t have enough bottom time left to explore. I really need to come back here properly equipped so I can spend more time exploring the site! 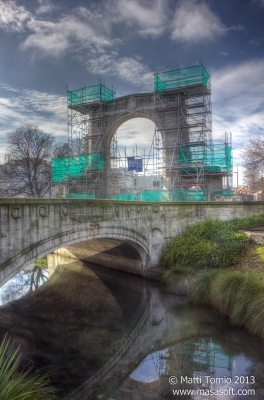 After a break of few months it was time to head back to Mt Gambier with Adrian. This time we had a pretty exciting trip planned with double dives in Piccaninnie Ponds and Kilsbys Sinkhole. We were also keen to finally dive the famous Shaft! Evan and Luke also joined us for this trip. However, as they drove over one day before us and had to be back by Saturday night we didn’t do that many dives together in the end. After driving over on Thursday we started out with a morning dive in Piccaninnie Ponds with Adrian. Unfortunately we hit some gear problems before getting in the water. One of Adrian’s hoses was quite loose and had to be tightened before jumping in. I also managed to get my drysuit zipper slightly undone while gearing up and had some trouble closing it again. By the time we got everything sorted we had almost lost half of our one hour slot already. We still jumped in for a quick dive and luckily everything worked fine during the dive itself. Unfortunately there was quite a bit of organic mung floating around making the visibility lot worse than usual. Both the shallow first pond and the Chasm were bit murky, at least Cathedral was nice and clear as usual. In any case, not the best conditions for photography. Shortly after Adrian and I got out of water Evan and Luke also arrived. We still had bit of a wait ahead of us before the next slot at 11 am. We also had a visit from a ranger again, you really need to stick to the slots here! The dive itself went smoothly, no gear issues this time around. We did a fairly typical Pics dive, first down the Chasm and then some exploring in the Cathedral. We also some rather large eels, unfortunately none of my photos of them worked so well. To finish up the day Adrian and I dropped in for a training dive at Gouldens. I didn’t bring my camera this time as we were mainly practicing various line skills. Seems I needed the practice too. while reeling in I got the line pretty badly tangled just before reaching the primary tie-off. That resulted in a pretty mad mess, it took a while to get all that sorted in the water. For Saturday we headed over to Kilsbys for a double dive. For the first dive we visited the deep end but kept the max depth fairly conservative. Instead of pushing any of the deeper holes near the back we tried exploring some of the smaller openings, unfortunately we didn’t find anything particularly interesting. Visibility in Kilsbys was poorer than usual too, even if still excellent. There’s also lot less sunlight there in the winter, which makes photography more challenging. I took quite a few diver shots on this dive, including some shots of Evan and Luke. Decent shots but nothing spectacular. After a surface interval we hopped back in with Adrian. Evan and Luke had already started driving back to Melbourne. Sun was now in a better angle and we got some pretty nice sunbeams on this dive. For this dive we stayed in the shallow end and also did some skills practice, including buddy-breathing and valve drills. 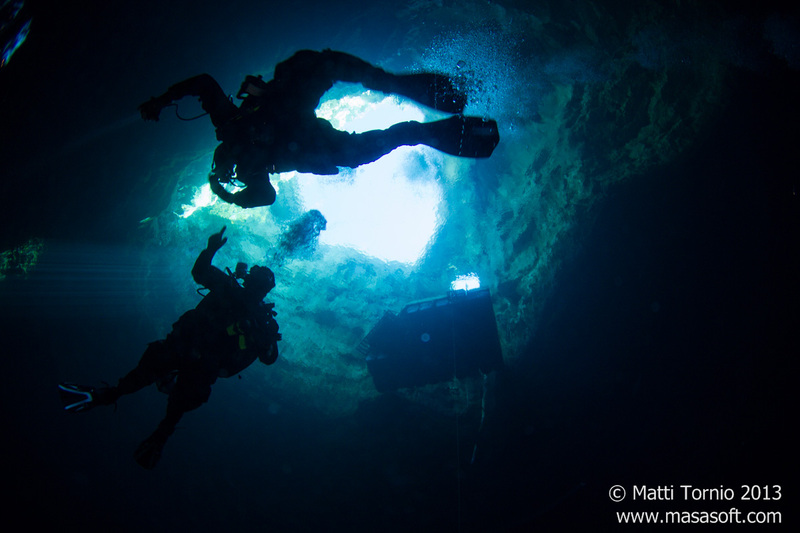 The light worked quite well for diver silhouettes, so I was mainly focusing on those during the dive. This was certainly a more productive dive than the first one, although some of our earlier dives in the summer months were even better. 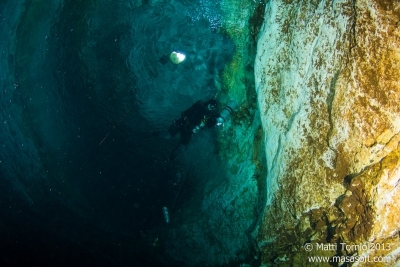 On Sunday we finally had a chance to dive the famous Shaft. 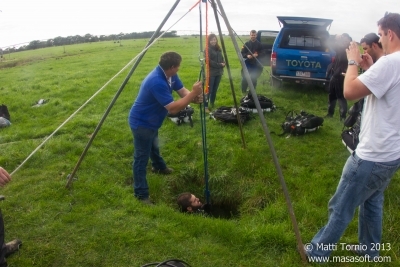 This inconspicuous little hole in the middle of a paddock opens up to a large and deep cave and is one of the most famous dives in Mt Gambier region. 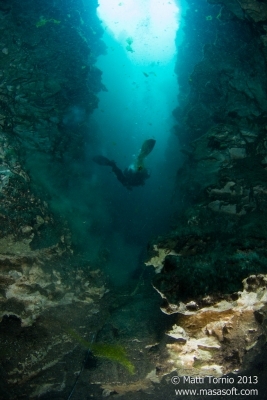 All diving in Shaft is supervised by an authorized guide and as a result the site is only open around once a month. Additionally, since water level is about 10 meters level below ground some special gear is required. Luckily our guide Kelvyn Ball has all the necessary gear including a winch, so getting up and down the hole required minimal physical effort. The dive itself was excellent and little bit exciting too. Especially in winter it’s quite dark down there, only little light comes through the hole at the top. Unfortunately the shaft of light that gives the site its name was nowhere to be seen too, apparently it’s only visible in the summer months. For our first dive we did a orientation dive with the guide. We started out at the rockpile in the middle. This pile is a result of a (rather futile) attempt to fill up the hole. To get a better sense of the scale we gathered at the rockpile and turned off our torches for a while. After a while our eyes adjusted to the near darkness and we could see some of the other divers in the distance. The place is quite massive indeed! The site is deep too, around 35 meters in the middle and lot deeper on the sides. Unfortunately diving in Shaft is strictly regulated, you are not allowed to dive below 40 m on air and even on trimix you are limited to 60 m.
The orientation dive was a non-decompression dive so we kept it fairly short. It was still a great dive, even though the combination of darkness and depth made it rather challenging for photos. We had our surface interval at the ground level, giving people chance to warm up. After a while we were winched back in for our second dive. This time we explored the wall at one end of the cave. We stayed above the 40 m limit but the bottom there is lot deeper! After the wall we headed back to the rockpile in the middle and as we were getting into deco decided to head up after a while. 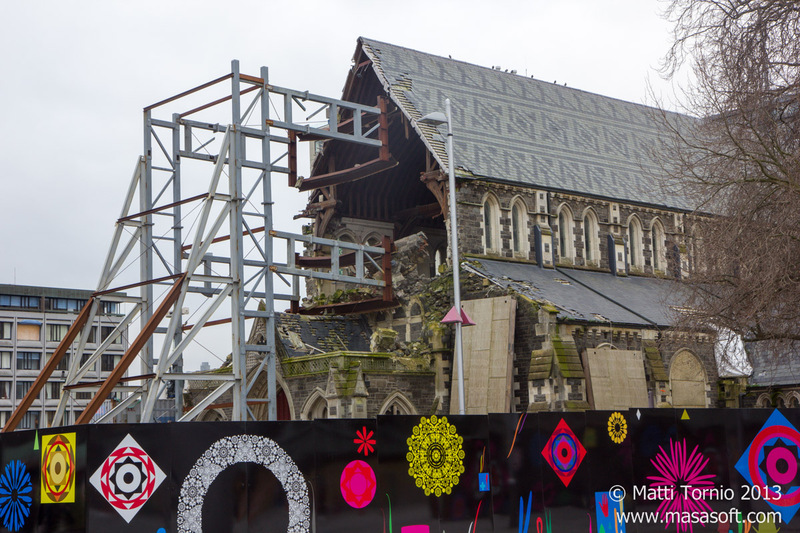 I tried to do some shooting upwards towards the entrance and sunlight but limited light made this really tricky and none of these shots really worked out. 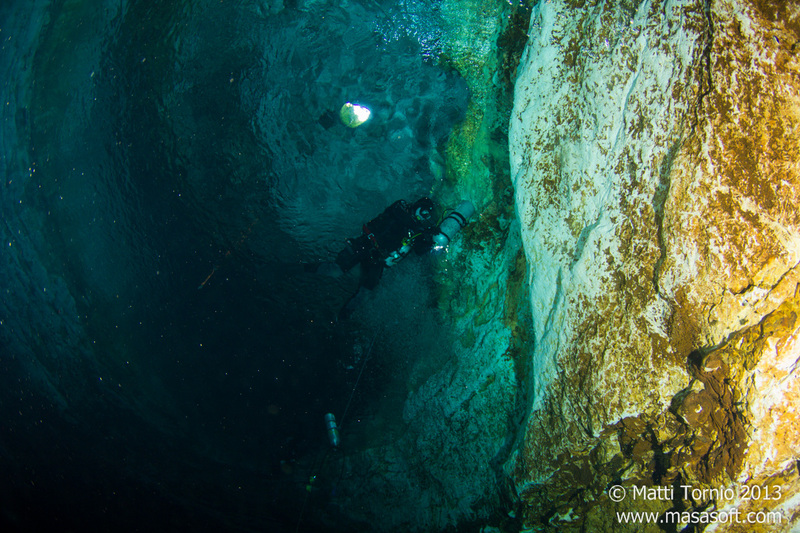 While not the most productive two dives photography-wise I still really enjoyed my time in the Shaft. I’m really keen to go back there too, especially in the summer when the shaft of light is visible again! For our final dive of the day we decided to do a night dive in Ewens Ponds, something we hadn’t tried before. We waited for the sunset in Port Macdonnell, I was trying to some landscape photography for a change but unfortunately cloudy skies lead to some disappointing results. I also managed to run my camera batteries almost empty, the cool weather that afternoon wasn’t helping. Teaches me to bring all my spare batteries along! Luckily weather started clearing up during the evening, we had a decent sunset and by the time it got dark the sky was quite clear already. Unfortunately it was the new moon, but it was still magical floating around under a starlit sky. We actually spent most of the dive on the surface, it was simply too pretty floating around and watching the stars. Drifting through the channels in the dark was pretty amazing experience too. The only thing marring this sublime “dive” were some gear issues. By the time we got in the water my camera battery was pretty much empty, I was only able to take a couple of shots before it ran out. This was rather annoying, particularly since there’s lot more life in the Ponds during the night. We saw loads of big eels, quite a few fish and plenty of yabbies. My primary torch was also acting up early during the dive but then started working fine. To wrap up the trip we did some skills training in Gouldens on Monday. We have our cave course scheduled for early June so it was important to brush up some of our skills. We spent fair bit of time practicing line skills and buddy-breathing. After a while we felt we had had enough so we got out and started the long drive back to Melbourne. This was another great Mt Gambier trip. Not the most productive trip for photography but I still enjoyed my time there quite a bit. Our next visit will be the cave course in June, can’t wait for that! After our weekend trip to Barwon Heads in early April not much has happened on the diving front. Weather and the ocean are slowly getting cooler as we are slowly heading towards the winter months. Autumn also means more storms, but luckily we have been fairly lucky on that front so far. While he haven’t done any boat dives since Barwon Heads we have been still been able to do at least few shore dives each weekend. We have had an influx of new members too, which has meant slightly less time for photography. While I don’t mind watching after new divers every now and then it’s also nice to have dives where you can mainly focus on photography. On the other hand it’s good to have some new blood, particularly people who are not scared of diving even in the winter. I have also settled in my role as the new dive coordinator for our dive club. The job has kept my bit busier than I anticipated but I’m still enjoying it for the most part. 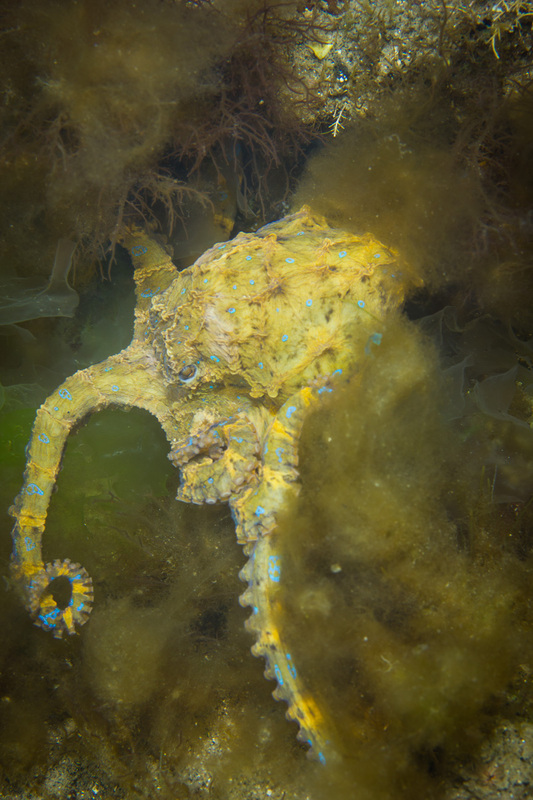 For the second weekend of April we went for some shore dives on the Mornington Peninsula. It was a pretty busy weekend and we had lots of new people with us. Having so many inexperienced divers with us lead to two issues. First of all, we ran out club weights and only found out while down on the coast since some people had seriously underestimated the amount of weight they need. And we could have used more experienced divers too to watch after the never. In the end we didn’t have any real incidents, but things could still have gone lot more more smoothly. For the first dive we had decided to visit Flinders Pier. Checking out Weedy Seadragons is always a cool experience for anyone who hasn’t dived in temperate Australian waters before. Unfortunately the conditions were less than stellar there, for some reason visibility was extremely poor and there were some waves too. Surely not the best combination for getting new people in the water! In the end few people had to sit out the dives since we simply didn’t have enough weights to get everyone underwater. While some people saw some cool stuff, including a baby shark and a cuttlefish, the dive in general was bit of mess and rather disappointing. Luckily our second dive worked out better. We moved over to Rye and redistributed the weights best we could. This still left some people somewhat underweighted, but at least everyone was able to stay under this time. We saw the usual fish life and some crabs. We also had a quick surprise visit from a seal that was swimming around the pier! Apart from few minor issues this was quite an enjoyable dive. A week later we headed back to Mornington Peninsula. 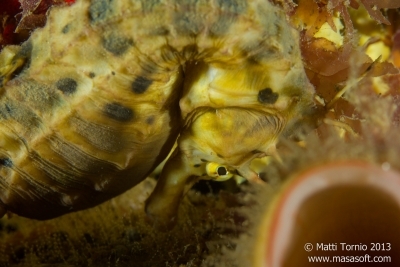 This time things were less busy and everyone had at least some experience with local diving. This time I was diving with Seth and Mathilde. Debbie and Cameron were with us too. We started out with a decent dive at Blairgowrie. As usual I put my macro lens on for some nudibranch shots. Unfortunately I came back slightly disappointed. While we saw plenty of nudibranchs pretty much all of them were short-tails. While they are pretty enough, I was hoping for some more variety. Oh well, it must be the time of the year as many nudibranchs are seasonal. To finish up the day we hopped in for a night dive at Rye. While we didn’t see anything that special on this dive it was still a good one. There were plenty of seahorses and crabs along with the usual fish life. And the seal was there again, this time he spent lot more time following us around too. A couple of times he got really close to us, unfortunately photographing a seal at night with a macro lens on is pretty much impossible. Still, it was a nice extra for an already enjoyable dive. And finally, on the 25th April we had a quick dive in the Point Cook marine sanctuary with Adrian. With strong northerlies blowing we had opted for something close to the city. This worked out nicely since we were mainly testing out Adrian’s new Otter drysuit. Point Cook is supposed to be a pretty good dive close to the city with rich fish life and some bigger critters too, including rays and the occasional shark. Unfortunately this is only the case in summer. We went there in autumn and only saw a total of two fish. 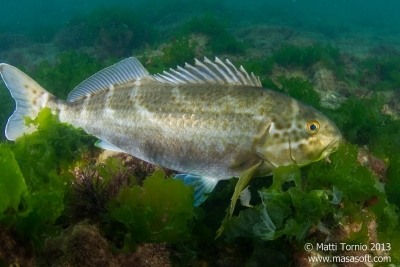 One of them was a decent size dusky morwong, a nice surprise on an otherwise boring dive. At least we got Adrian’s suit tested and after closing the zipper properly found it performing well too. Should be lot comfortable than diving in his old “dry”suit with massive leaks! The site might be worth another visit next summer, but apparently during the colder months it’s not really worth diving unless truly desperate. 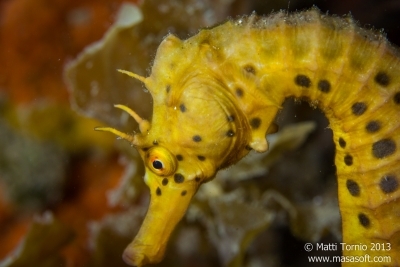 Apart from the superb boat trip in early April rest of the month has been somewhat mediocre dive-wise. Luckily there’s another Mt Gambier trip coming up soon so I can look forward to some excellent diving and superb visibility again! The last time we launched our boat from Barwon Heads we did some excellent reef dives and the short boat rides were a plus too compared to launching from Queenscliff. So when the marine forecast for the weekend was looking almost perfect we were keen to head there again. This time we also stayed there overnight instead of doing just a day trip. We brought down both our boats and camped the Saturday night in Barwon Heads Caravan Park. 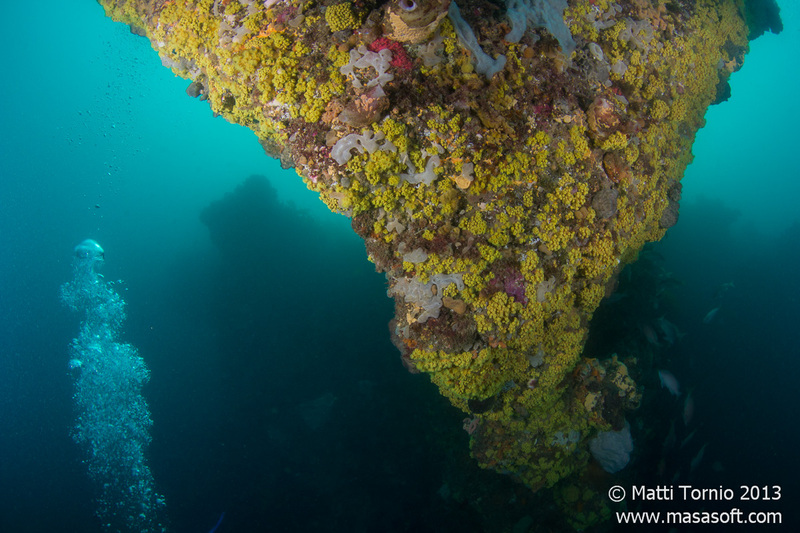 For the first two dives on Saturday we visited Chimney Rock and Stellar Reef. Visibility wasn’t as great as the last time we were there but that was to be expected after the algae bloom and some stormier autumn weather. For some reason Chimney Rock didn’t appear as impressive as last time around. I guess in the middle of the day the lightning isn’t as dramatic as in the evening. It was still a nice dive with Nicky and Mel B. The bommie itself is of course very interesting and we also saw lots of fish and a cuttlefish hiding under a ledge. Stellar Reef was a nice dive too. 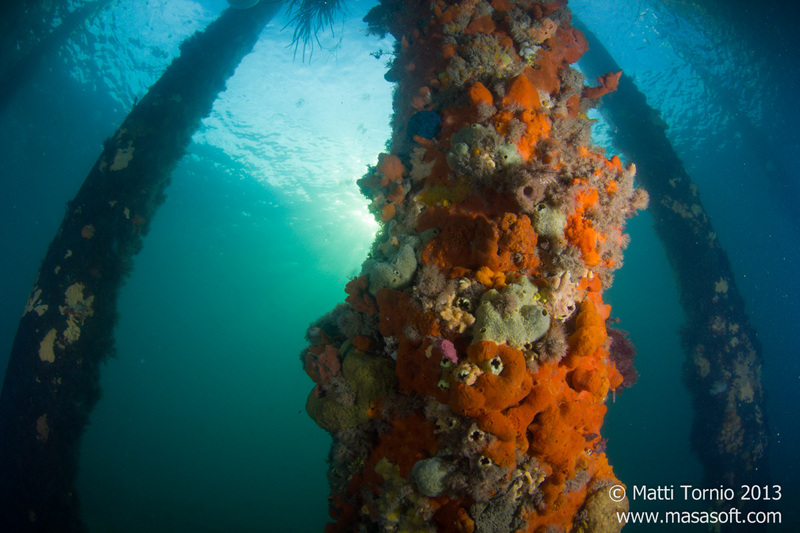 The structure of the reef was again very interesting and there was plenty of fish life around. Unfortunately the visibility was quite poor so the conditions for photography were not the best. The first group of divers reported seeing several Port Jacksons but they must have scared them away as Nicky and I didn’t see any during our dive. To finish up the day some of us headed for a third dive at St Leonards. This was a night dive with Bauke, Seth and Casey. I haven’t done a night dive at St Leonards before and hadn’t dived the pier in quite a while for that matter. So it was nice to get back there as the pier is one of my favorites. 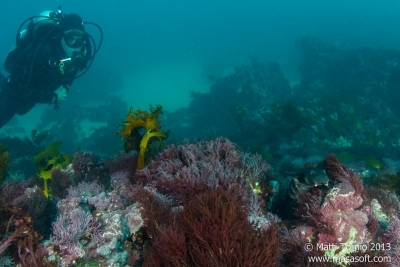 The visibility was about the same as on the reef sites we did earlier, i.e. quite fine for a night dive. A very welcome change from the couple last times I have been at St Leonards with pea soup water! The dive itself was interesting enough. This was the first night dive for Casey and Seth so we kept a close eye on both. There was a surprising amount of fish life down there and a great variety too. 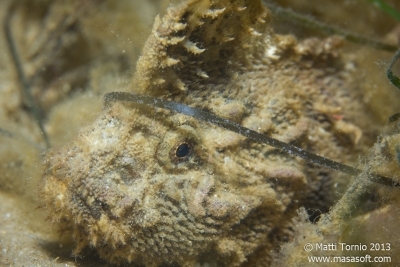 I even managed to spot a velvetfish which I was quite happy about, usually they are very well camouflaged. We also saw a couple of eels on the bottom but unfortunately I didn’t manage any sharp shots of them. After a late bbq dinner and some socializing we headed to our campground for a good night’s sleep. Saturday was the last day of daylight savings, so we had an extra hour of sleep too! So on Sunday morning everyone woke up more or less refreshed. It was finally time for some wreck dives. 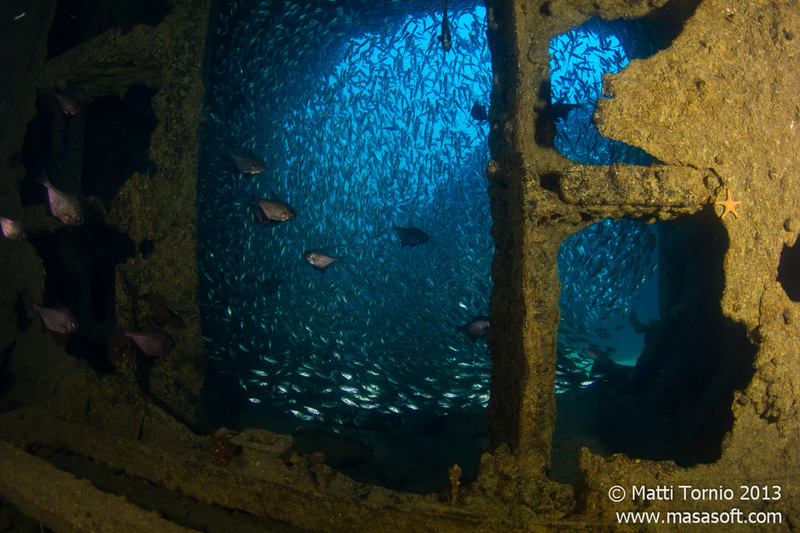 I has been ages since I had visited any of the local wrecks so I was very much looking forward to the dives. Luckily the day didn’t disappoint either. Unfortunately all our plans didn’t quite work out in the morning. We were hoping to get some airfills before taking the boats out to make sure we had enough full tanks for the rest of the day. Unfortunately when we Crystal and I got to Dive Victoria’s shop in Queenscliff the place was closed! With no notes on the door and calls going to voicemail this was bit mysterious. We spent around half an hour waiting outside but eventually we decided to give up. We went to Dive Plus shop instead to see if they could fill our tanks. Luckily we could get our fills there, , even though it took a quite a while as their fill banks weren’t filled up yet from previous night. So with that out of the way we drove back to the boat ramp, quickly got everyone in the boats and headed for HMAS Canberra. We had booked the 10 am slot for Canberra and because of the delays in the morning we didn’t quite make it in time. But luckily we were there early enough that everyone still had time for a decent dive. I ended up buddying with Luke and Pete with Luke leading the way and Pete and I taking photos. This wasn’t quite the best dive I have done on Canberra but it was still an interesting trip through the wreck. We entered from one of the holes on the side of the wreck near the lower levels. Then we slowly worked our way upwards through the wreck with a short detour outside. We finally finished at the bridge, then some point swimming around the deck structures and finally proceeded to our safety stop. 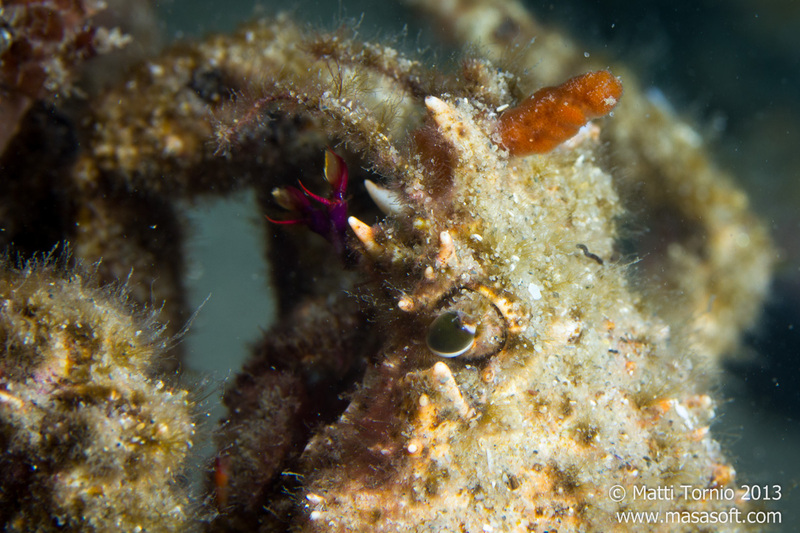 The minimal swell meant that we had almost no surge down on the wreck, a pleasant change from usual Canberra dives when you need to be little bit careful near the entryways. The wind had picked up a little when we were underwater, however, and so we had small waves waiting for us on the surface instead of flat seas. For the second dive our boat went to J4 Submarine for another wreck dive. This was also Luke’s 300th (logged) dive but he opted not to follow my lead and did the dive fully suited. Besides, Evan was driving the boat again and I think he has had his share of naked male divers for a while! I have done this sub several times and never had a truly great dive there. 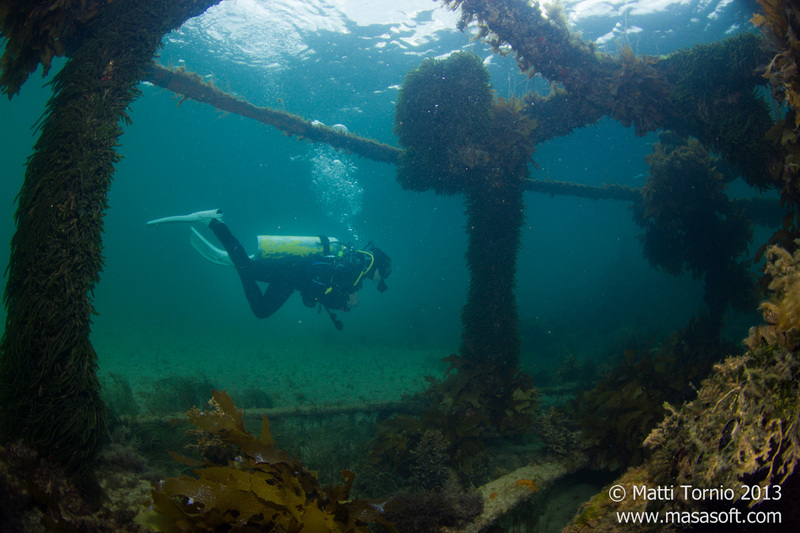 Luckily this was a pretty perfect day for visiting the wreck and doing some penetration too. Surge is often an issue here but luckily today it was pretty much non-existent making for very easy penetration. We also had great visibility on the dive, the best of the weekend. The only minor issue was missing the wreck itself with our shotline! Luke and I went down first and as we got down the sub was nowhere in sight. Water was very clear so this was quite worrying. Luke picked up the shot and I could faintly see a shape in the distance. We started swimming towards it and after a while it was clear we had found the sub. So no big harm done, apart from the fact Luke spent a fair bit of extra air carrying the shot. By the time Nicky, Carol and Mel followed us down the shotline the shot was already in place next to the sub. With that issue sorted we got started with the dive itself. We entered the sub from a hole near the stern and started making our way towards the bow where the sub is broken open. There are a fair number of small and some larger holes in the sub so there was decent amount of light filtering in. It was still very dark for photography so I did little some experimenting with slow shutter speeds. The results were somewhat mixed, I guess I need some more practice with that. While nice the swim itself through the sub is not that special. Luckily we had a nice surprise waiting for us at the place where the sub is broken in half. Outside the entryway there was a huge school of fish that was thick enough to almost block the way! 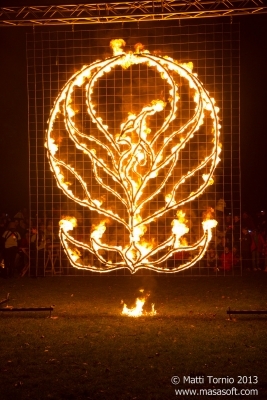 An impressive sight indeed. We stopped for a while with Luke and I took several shots before moving on. Even when we swam through the school the fish didn’t want to budge, the school simply reformed around us and covered the exit again once we had passed. We also had a quick look inside the broken off bow and the torpedo tubes. There were lots of fish there too. Afterwards we spent the rest of the dive outside the wreck, first we had a look at the conning tower and the plaque placed there by the first group that rediscovered the sub. Afterwards we swam along the top of the sub to the stern and back. At this point we were getting into to our NDL so it was time to start our ascent and head for the safety stop. An impressive dive indeed and a great one for Luke’s 300th. Too bad the photos don’t really do it justice, getting the lightning right inside the sub was quite a challenge. Hopefully I can crack it the next I get there! It was a great weekend, too bad it’s pretty unlikely we get another one so nice until next summer. Despite the high temperatures this weekend we are definitely heading towards winter and cooler and stormier weather. Over the last few months I have been very busy with diving. It was just seven months ago when I did my 200th dive near Brisbane and now it was already time for my 300th during the Easter break! Unfortunately we didn’t manage to organize a major trip for Easter despite several tentative plans. Local forecast for the long weekend wasn’t looking that great for diving either. Luckily conditions slowly improved we finally had enough people signed up for Easter Monday to take the boat out. So off we went to Queenscliff for some easy boat dives inside the Bay. We had plenty of new club members with us so we started out simple and did Pope’s Eye first. I sat this one out as we already had a full boat. Besides, I only needed to do two out of three planned dives to reach my 300th so no big harm done. For the second dive we waited for slack and then headed for Lonsdale Wall. This was one of those days when slack water didn’t really happen, we had a fair bit of current running even though we were there right on time. It wouldn’t have been a huge issue normally, but with the new people on the boat it made things little bit trickier. I ended up buddying with one of our new members and unfortunately things didn’t quite work out for him. While he was using the same weights as on the previous dive he was still pretty badly underweighted for some reason. Despite several attempts my buddy couldn’t descend and even dropped his fin (which I was able to recover in midwater, luckily). By then it was clear the weighting wasn’t working out so we got back on the boat. Unfortunately my buddy was getting pretty seasick and didn’t feel like hopping in again. But I still needed to get at least a short dive done to get my 300th that day! So I hopped in by myself for a quick and easy solo dive. To keep things safe I stayed fairly shallow and kept my dive time short too. By the end of my dive current was picking up anyway, on the bottom I could stay sheltered next to the reef but during the safety stop I was definitely drifting a fair distance. To my annoyance I also noticed that my new neck seal was leaking a little. Apparently I hadn’t done a good enough job while gluing it on. Hopefully I can still get it fixed and don’t have to redo the whole thing! With the dive number 299 out of the way it was time for something more exciting! For the third dive of the day we headed just a short distance away from Queenscliff and got ready for a drift dive. The current close to the Heads can get pretty crazy sometimes and this was definitely one of those days. I did my 200th with my speedos on, now it was time for a proper naked dive! I stripped down and Evan dropped me off the boat with Seth, Alycia and Keith and off we went with the current. I didn’t bring my camera along for this one, you can’t really take photos while hanging on a line in a roaring current anyway. Visibility wasn’t that good (around 3 meters), which was kind of a mixed blessing. On one hand it gave me some extra decency. 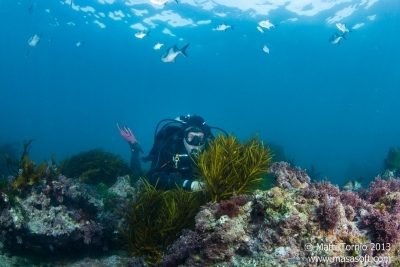 But it also made me crash straight into a bommie that appeared out of nowhere! Suddenly there was a big ledge straight in front me and I simply couldn’t ascend quickly enough to avoid it. Luckily I only hit my hand on the reef and nothing more delicate! After that incident the rest of the dive went smoothly. By the end of the dive I was starting to shiver a little bit in the 18 degree water, in total the dive lasted 30 minutes. Good thing we came up too, we had drifted a long way with the current and were getting pretty close to the shipping channel by the time we got back on the boat. It was definitely a pretty exciting and definitely memorable way to “celebrate” my 300th dive. Not sure what I’ll come up with for my 400th!